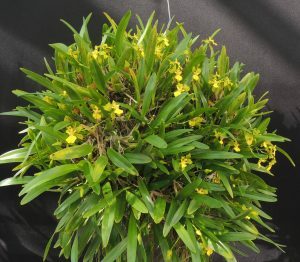 We are having a great time sharing our orchids with visitors at the British Orchid Show and one species getting a lot of attention is Oncidium longipes. 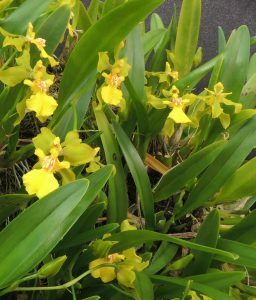 Oncidium longipes is a Brazilian species and we saw it growing in the forests around Macae de Cima in our school visits to Brazil in 2000 and 2006. It is restricted to primary forests and grows in the mid canopy amongst other epiphytes in dappled shade and high humidity. We find the species really prefers to be mounted where it responds by clothing the mount in growths that burst into flower in the Autumn. Flower spikes usually produce between one and three flowers but they are large for the size of the plant as seen here. We have grown our plants from flask (they flower two years out of flask) and they show considerable variation in colour and patterning.